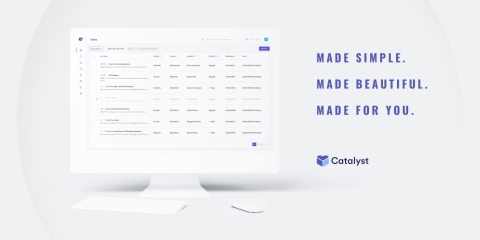 NEW YORK--(BUSINESS WIRE)--Catalyst, an intuitive customer success platform (CSP), today officially launches its Software-as-a-Service (SaaS) product which helps companies reduce churn and improve customer experience at scale. Catalyst has raised $2.4 million in seed funding led by True Ventures with participation from Ludlow Ventures and Compound. "Today, we're excited to launch a platform that can help companies scale their customer success operations more effectively,” said Edward Chiu, CEO and Co-Founder of Catalyst. "There are various tools on the market that help customer success teams manage their workflows; however, none are built with an intuitive user experience that focuses on the most essential needs of a Customer Success Manager (CSM). We are taking years of learnings and infusing them into software." Intuitive Dashboard: designed to help CS teams easily find meeting notes, detailed communication timelines, and customer data such as product adoption stats. One-Click Email Campaigns: communicate to entire cohorts of customers without the need for third-party marketing software. Customer Segment Builder: create segmented customer lists using Catalyst's natural language search tool. No more complex queries or multistep dropdown menus. Comprehensive Task Management: prioritize to-dos in a seamless way with the help of Catalyst's preconfigured, automated playbooks. Organized Note Taking: beautiful templates and an intuitive note-field insertion tool, including bi-directional sync with your CRM, makes taking organized notes easy. Edward developed the customer success operations at DigitalOcean during the company’s massive scale to over 150 employees, 100,000 customers, and more than $100 million in Annual Recurring Revenue (ARR) from 2014 to 2016. During his tenure with DigitalOcean, the Customer Success organization managed the entire operation using a homegrown tool after failing to find a suitable software in the market — which was the inspiration for Catalyst. McKinsey & Company, one of the world’s most successful management consulting companies, reports that companies in the top quartile of growth maintain lower net-revenue churn than mean performers. With even Salesforce re-branding as “The Customer Success Platform”, it’s a clear signal that customer retention is just as valuable as customer acquisition. Catalyst is the intuitive customer success platform helping companies reduce churn and improve customer experience at scale. Founded by CEO Edward Chiu and COO Kevin Chiu, the company has raised $2.4 million in seed funding led by True Ventures with participation from Ludlow Ventures and Compound. For more information visit www.getcatalyst.io. Catalyst, an intuitive customer success platform, today officially launches to help companies reduce churn and improve customer experience.